Do not chase after many techniques; practice one technique at a time and make each technique your own. The Aikido Institute would like to thank all who helped make the Seminar a great success over this past weekend. There was a great turnout, and I am sure all who practiced appreciate Sensei Claude's teachings and amazing technical skill. As well, we would like to congratulate Daniel Sinnot on successfully passing his Shodan Test, and Mark McDonald for Achieving the rank of NiDan (2nd Dan)! Great job guys. Keep up the great practice. 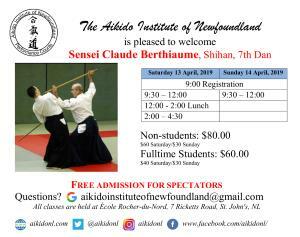 The Aikido Institute is pleased to welcome Sensei Claude Berthiaume (Shihan) on the weekend of April 13, 2019. We look forward to great weekend of practice, and to see everybody on the mats. Image courtesy of Colette Phillips. The Aikido Institute is very happy to announce Meagan McDonald's achieving of 3rd Kyu on Junuary 25th 2019. Cantratulations Meagan! Keep up the great practice. Great job guys. we look forward to continuing our practice into 2019. The Aikido Insitute would like to wish all a very Merry Christmas, and a Happy New Year. We would like to offer our thanks to all the members that allow us to practice and further develop our skills in the wonderful Martial Art that is Aikido. It is with great happiness that the the institute is back to regular practice. We hope all have had a wonderful summer. It is great to see everybody on the mats, and so eager to practice. Today's class has been cancelled for the Victoria Day weekend. We wish all have a safe long weekend, and look forward to seeing all on the mats on Tuesday. There have been some pictures uploaded from Boyd and Meagans grading.